After college my first job was in corporate finance, but after a few years I was able to switch over to the Computer Information Systems. I started out as a programmer coding in a language called “COBOL”. I am proud that not only was COBOL co-invented by a woman ( Grace Murry Hopper) but also the first computer programmer was a women (Ada Lovelace). I loved coding because it was very logical: you write a string of commands using the syntax of the programming language with the goal of automating a process. While I started programming on mainframe computers (workstations and servers networked together to process large amounts of information), today you can program on almost any device from a tablet to a personal computer. If you use the right syntax to carry out some sort of process, then it will work. If you do not use the right syntax or design an incorrect process then the program won’t work. I enjoyed my programming jobs even if it meant going through lines and lines of code to find one letter or symbol that was wrong. I moved on to jobs in database design, international computer auditing, computer security consulting at one of the biggest firms in the world and then on to founding my own website. The ability to understand programming basics has opened up many career doors and opportunities. My love of technology has also kept my skills current because I enjoy learning new programming languages and social networking platforms (and invest my time doing so). My website TechMamas.com is a wordpress blog that has a rich text option that takes care of programming behind the scenes (I just create my blog post like I would a word processing document). But I also do my own coding to fix blog post formatting and make design changes. Even knowing HTML has opened up so many opportunities for me! One of the most important things said in the video was: “Don’t just consume things – create things”. I feel it is important to show our kids, who are growing up in the digital age, that technology should not only be consumed but also used to create. 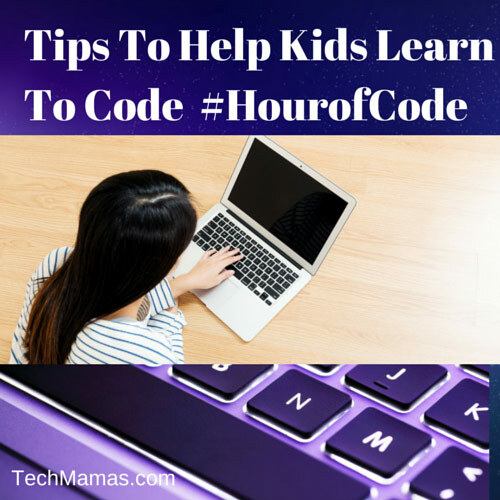 Here are my tips to help kids create their own projects by learning to code. What are your tips? The next tip is to make learning to code a fun family activity and inspire kids with logical incentives if needed. It is important to participate with your child when they first learn to code and to be supportive when they need help. It is also important that learning to code is a fun activity, so if incentives are used they should be “positive” instead of punitive. For example, our family logical incentives are creating technology projects (including coding, video, building, designing) will earn them screen time/consuming technology. It is also important to help kids find the right type of programming language and platform to make learning fun – not all drag and drop are created equal! We tried some drag and drop programming platforms that were confusing. Other platforms, like the ones mentioned in this post on Edutopia “15+ Ways of Teaching Every Student to Code (Even Without a Computer)” such as MIT’s Scratch and Tynker, were fun and had a great interface. Both of my middle school twins enjoy using drag and drop programming and have now even moved on to platforms such as Youth Digital Minecraft Mod Design which give an introduction to Java programming through mod design. Another online Minecraft Modding class is called ThoughtStem Minecraft Modding Class . There are inspirational programs such as Girls Who Code that “inspires, educates, and equips girls with the computing skills to pursue 21st century opportunities” There are also sites such as Roblox and those explained in Common Sense Media coding section that offer ways for kids to create their own apps and games. I will cover the range of platforms available in a separate blog post because there are so many! Luckily, the Code.org/Learn section also lists great coding websites for kids. When my teen took the Python class he did understand the basics but was not as interested in programming as he thought he would be. So we told him to do the best he could in the class and find other ways to be a technology “creator”. Knowing that he just needed to do the best instead of feeling the pressure to “master” programming helped him feel less stress while learning. We wanted our son to discover what his technology passion was. Luckily it did not take our teen son long to figure out that his true passion was computer design (engineering). He can spend hours going over computer specifications and features. He loves to fix anything related to a computer and technology. He decided that his “creator” project would be building his own computer! So if your child is not excited about coding, he or she may be excited about computer design, photography, video editing or other ways to experience content creation. Finding your child’s passion will turn something that could be stressful – into a skill they develop on their own because they love doing it. When kids have a passion to learn coding, online computer programming courses can help take learning to the next level. There are sites such as Code.org and Khan Academy which are geared towards kids but there are also an unlimited amount of courses for teens and adults that are either free or available to purchase. Some examples are Edx, Coursera, Udemy (like this course on Python), Curious (like Ruby on Rails and HTML/CSS) and many more. Parents that want to update their job skills could also participate in the #hourofcode and look into sites such as Udacity that has Nano Degrees. Click here for the full list of Khan Academy Computer Programming videos. Because my husband and I have tech jobs that we got based on our tech skills, we like to talk to our kids about all of the different types of tech jobs (and other jobs) that utilize tech skills. Having a basic understanding of programming and technology can be a prerequisite for many careers. It is also important to help them understand that programming can be challenging. My earlier career as a computer programmer helped me understand the reality of the commitment. 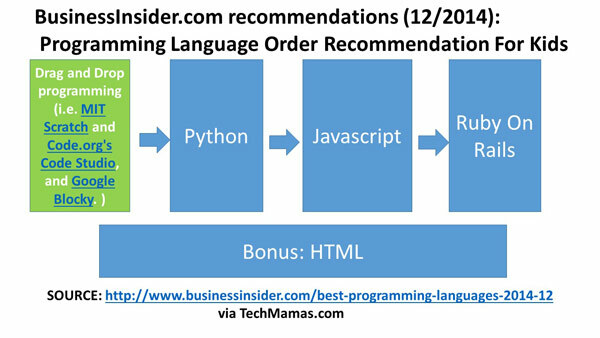 Another Business Insider article titled “A Programmer Describes How He Nearly Went Insane Learning To Code” shows the reality of having a career in programming. At the same time, there are unlimited examples of how kids that were truly interested in programming and engineering created amazing things. Kimberley Bryant, Founder of Black Girls Code, shared that when she was a freshman in Electrical Engineering that Fortran and Pascal were the popular programming languages (Note: I studied Fortran in college). Marissa Mayer earned a Bachelor of Science in symbolic systems and Master of Science in computer science and went on to become Google’s first female Engineer. Mark Zuckerberg’s programming skills helped him create Facebook. Bill Gates was 13 when he first got access to a computer and before he knew it- he and some friends were teaching the programming class. Even NBA Superstars like Chris Bosh believe that everyone should learn to code. Are you going to have a family coding day this week? Sam Patterson posted on Edutopia with some ideas for that!